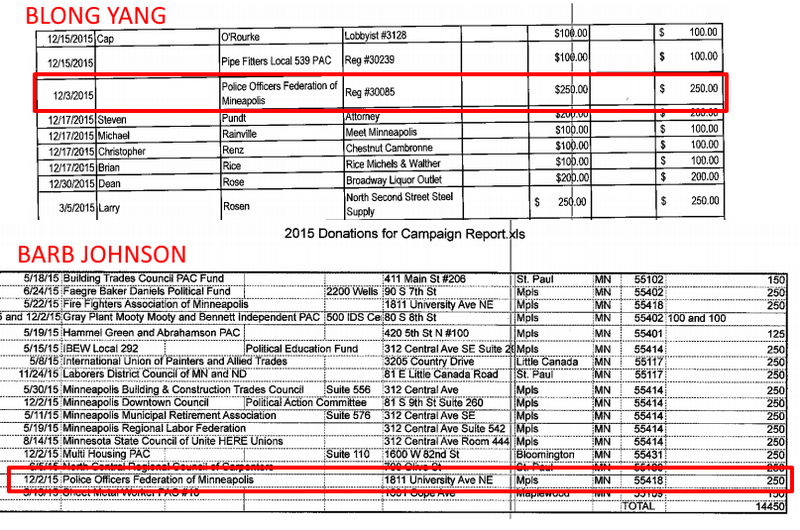 Minneapolis City Council campaign fundraising disclosures were due on February 1st. The Star Tribune ran an article about Council fundraising on February 5th. Council President Barb Johnson filed her report on February 8th. As a result there’s not a single mention of Barb in the story. Pretty clever, Barb, but your tricks don’t work on Wedge LIVE. (Full disclosure: Andrew Johnson–noted jack-o-lantern and “Friend of the Show”–was also late with his filing, but he was quoted extensively in the Strib story). It may shed some light on internal Council politics that Barb’s campaign made donations of $250 to all of her colleagues on the Public Safety Committee (Yang, Reich, Warsame, Palmisano) except for Cam Gordon. Though you have to think Cam might have turned that money down. Blong Yang finally has a positive balance, after paying off the loan he made to his campaign for the 2013 election. Lisa Bender runs by far the most efficient campaign, spending the lowest percentage of funds raised among any of her colleagues. If you’re a fan of Alondra Cano, you’d probably like to see her spend less and raise more. Elizabeth Glidden and Cam Gordon are doing their best to keep money out of politics. Full 2015 campaign finance reports for every Council Member.